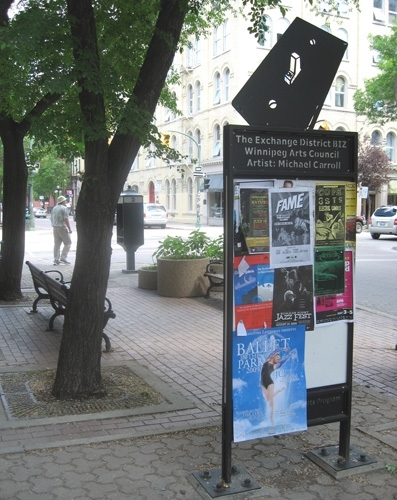 The Exchange District BIZ and the Winnipeg Arts Council’s Public Art Program have collaborated on a unique artist-designed poster board project. 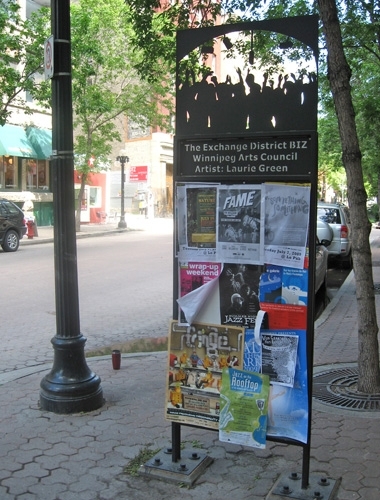 The poster boards in the Exchange are well used by the community to present information about the many cultural events taking place. Since the old poster boards needed to be replaced, it was an excellent opportunity to include artists in the new design. A Call to Artists was issued in 2008 for designs for the top portion of the boards. Thirty eight artists submitted 114 designs and a jury selected the winning designs by Winnipeg artists Michael Carroll, Laurie Green and Judith Panson. 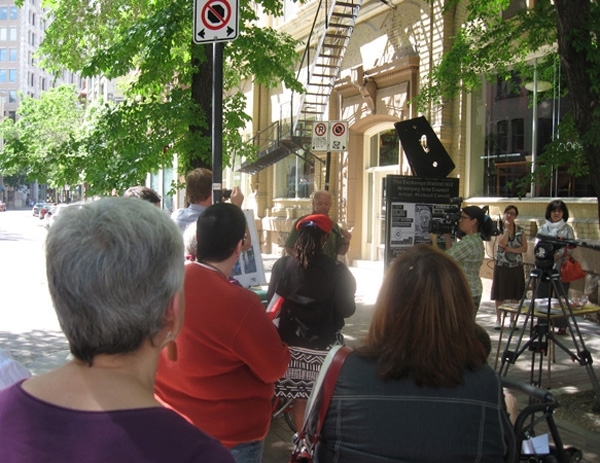 The images range from a witty “on” light switch to a crowd applauding a stage event to a silhouette reflecting the architectural gems for which the Exchange District is so well known. 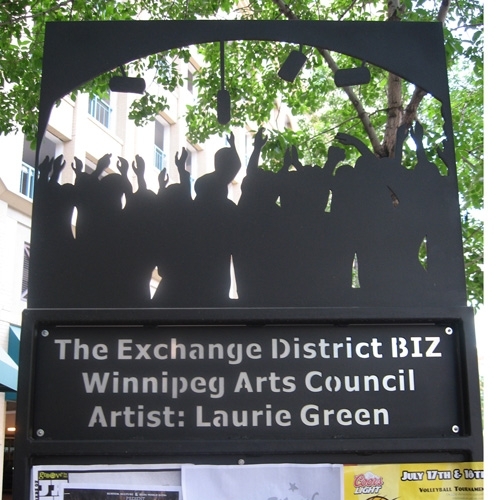 The Exchange District is the hub of the arts community in Winnipeg. With a large number of art galleries and studios in the area, it is fitting to present the works of artists on the streets where it can be encountered by all. 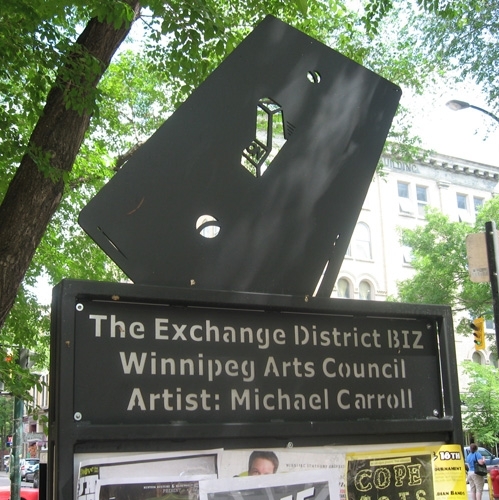 Michael Carroll is an artist, illustrator and graphic designer. He has a varied practice that ranges from traditional printmaking to digital media. His work has been exhibited in Manitoba and Germany. He won the Manitoba Book Awards Manuela Dias Book Design of the Year (2015) and a Western Canadian Music Award for his design of The Weakerthans Album Reconstruction Site. He lives and works in Winnipeg. I consider myself an eclectic visual artist. I use found objects, and a variety of styles and media for the project before me. The piece takes me on a creative journey. I received the Award of Excellence for Graphic Arts at Sturgeon Creek Regional Secondary School. Interest in social justice issues led me to pursue a Bachelor of Social Work Degree from the University of Manitoba. Kerri Irvin-Ross. For two years my design has been used for 'The Golden Carrot Awards' presented by the Manitoba Food Charter and I am one of six artists to create food scenes for their 2010 Calendar. Encouraging public art turns our city into a tremendous gallery that all citizens and visitors have an opportunity to enjoy and actively interact with. I am honoured to be chosen to contribute to Winnipeg's Gallery. 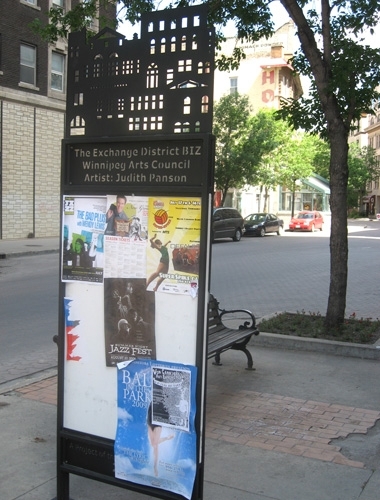 Judith Panson was born in England and has lived in Manitoba since 1965. She received her art degrees from London and Plymouth Universities in England. 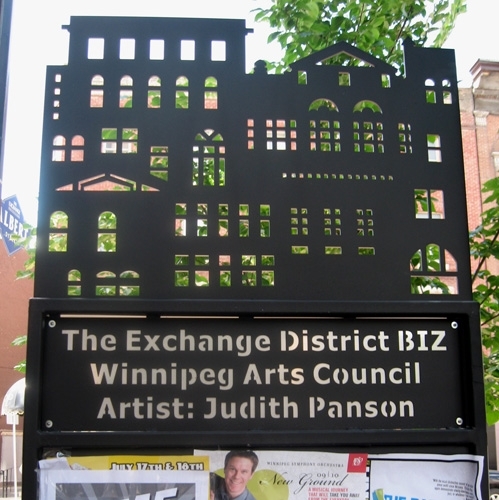 Judith has taught art at all levels of education from elementary through college in England, Canada, France as well as the Hashimite Kingdom of Jordan and taught for thirty years in Winnipeg before retiring and going to work in a local art gallery. She has also worked in various art positions including design studio, pottery studio, department store window dressing, stage set design and freelance illustrating where her artwork has been published in cook books, educational magazine and chap book covers, and in twenty children’s books. She has won awards in water media, printmaking and art quilts in juried shows in Manitoba and Ontario. Her work hangs in both corporate and private collections in Australia, Canada, England, Mexico, Switzerland and the United States.